Wooo Hooo! It is Cinco De Mayo today! This is my favorite made up holiday because I get to eat all kinds of yummy Mexican foo. Today, I decided to go for baked brie because it is great for dipping. Also, it only takes ten minutes or less to put this recipe together. I am sure this happens to you to, because, it happens to me all the time. I will get a call on a Saturday morning from a friend who wants to come over for a “chat”. Why did I put the word chat in quotes? That is because they are not really coming over for a chat. Instead, they want to see what snacks or meals I will serve them. My friends are free-loaders extremely supportive and always willing to be taste-testers for my recipes. So, back to my point. This recipe can be made in ten minutes or less. By the time your friend has hung up on you, you will have the salsa already made. This baked brie recipe was so much fun to make. I love seeing all that brie oozing out and I just took my nacho chip and swooped into it. 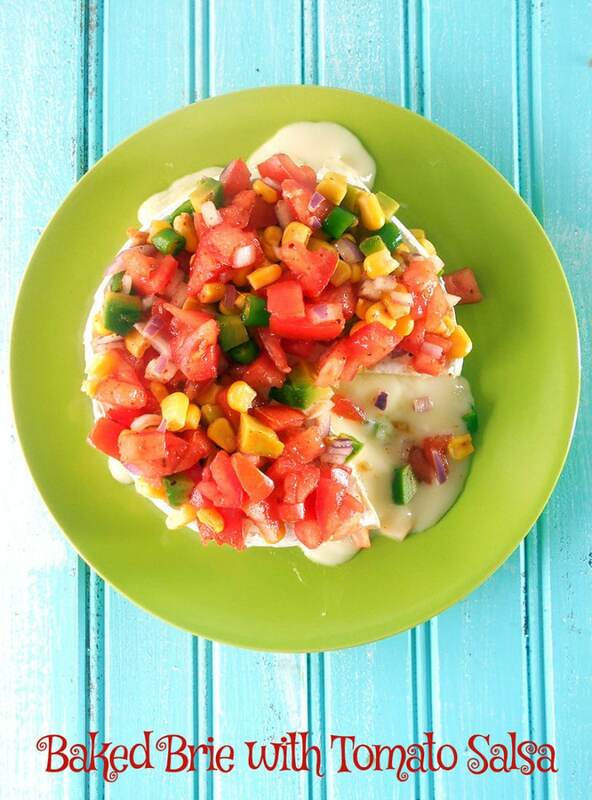 The cheese, tomato, onion, corn, avocado and cayenne pepper just burst into delicious flavor. It was like a mini fiesta for my taste buds. Use any salsa recipe with this baked brie. I think it is better to use your favorite salsa with brie because you want to really want to savor the flavors. P/S: Have you tried my grape and cherry tomato salsa? What is your favorite Salsa recipe? Wow! This is inspired and I can see myself putting this out for summer parties! It looks so fresh! Thanks for stopping by my blog the other day! 🙂 You’ll see me here often, I’m sure! I’m always looking for fun meatless meals – and I see so many here that won’t make anyone feel deprived! Thank you, Frugal. I am so happy to have you visit my page. I love your unique recipes too. ooooh…I love Brie! 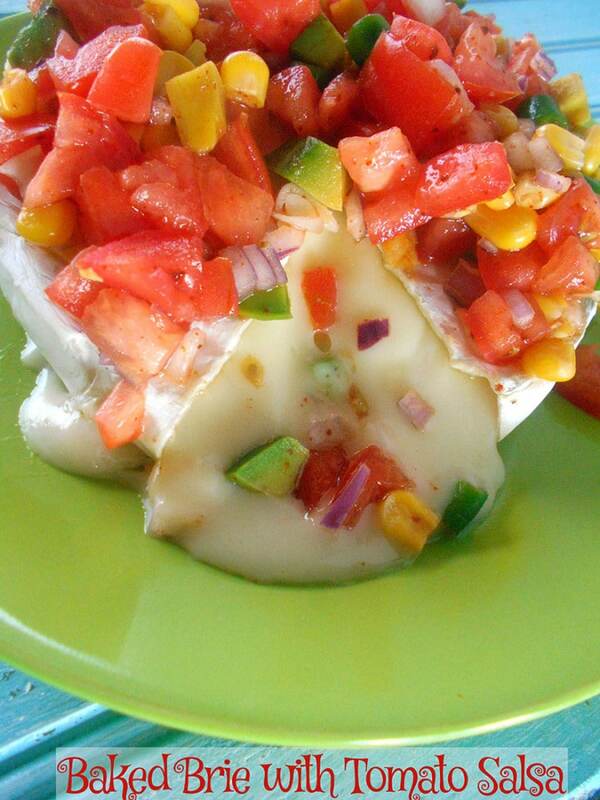 Great idea to bake with the salsa…seems like an easy appetizer to make last minute! This looks so good, Rini! 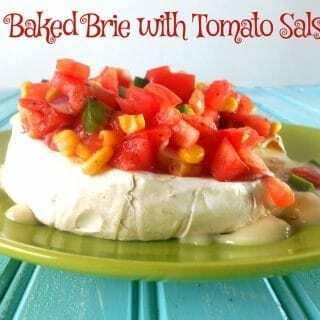 I’m not usually a big fan of Brie but I would absolutely love this 🙂 I can think of so many occasions where your Baked Brie with Tomato Salsa would be absolutely perfect! I have only had brie with pears or baked with cranberries and honey. This looks like an amazing combination and I can’t wait to try this for summer! 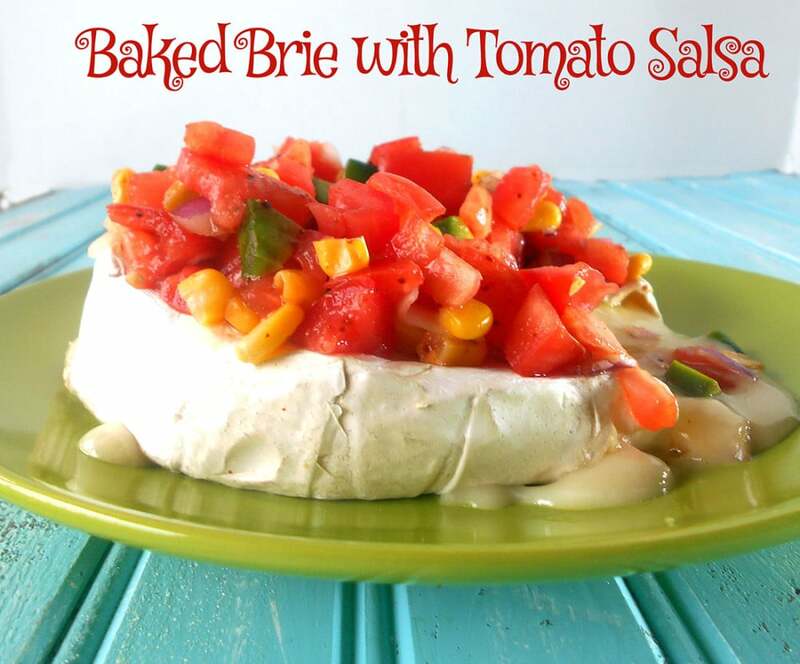 So rich and decadent with the brie but light and fresh with the salsa! YUM! Thank you, Jennifer. I think you will like the savory version too. I have to try it with cranberries and honey. What a great idea – to bake brie without a pastry crust! It’s so simple, but honestly this is the first time I’ve seen it. And having the salsa melted into the cheese looks divine. I’ve actually never tried baked brie and I LOVE all things cheese. This recipe would work really well for summer bbqs and parties! Thank you, Tonia. That sounds like a good idea. You know, I’ve never baked brie before. Not sure why I never thought to do that because it looks so much better all melty. The added fresh salsa looks wonderful. Great idea! I love this idea. I typically do baked brie with sweeter accompaniments, so this would be a nice change up! What a colorful and vibrant dish! 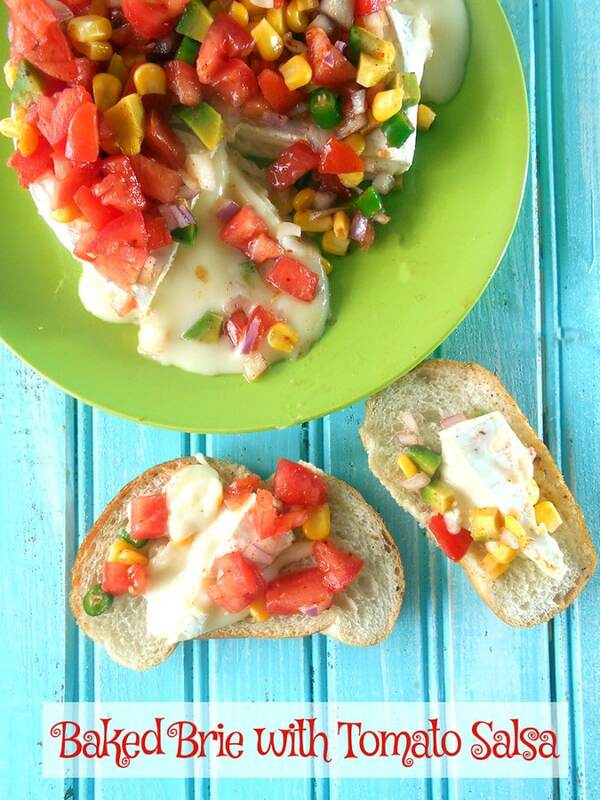 I love the combination with the salsa so this is pretty awesome for summer! Thanks for sharing! I love, love, love baked brie. I usually pair mine w/ a blueberry jam but this sounds awesome. What a different flavor profile this is. I really like it! I love baked brie with all kinds of toppings, but never thought of trying salsa with it. So colorful and festive! I love baked brie and love this idea of serving it with salsa. I love all salsas so I can’t choose just one. Thank you, Janette. I know what you mean about salsa. There are so many good ones to choose from. What a fabulous party appetizer. The brie is a great host for this flavorful salsa. Thank you, Sandi. I agree completely.